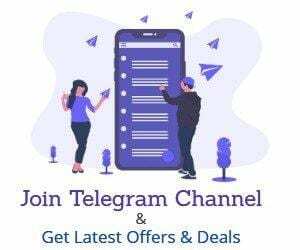 You will get all the latest deals instantly to you while you are connected with us through our Telegram channel. There are many games going on where you can win a lot of prizes and free stuff. As usual, Flipkart and HDFC are Offering 10% Discount on all purchases. You can get this offer on HDFC Debit card/Credit Card & EMI Transactions. First Visit Flipkart For The Sale or click the Link to directly access the big Shopping Days landing page. Now add the deal to your cart & proceed to payout. Pay using HDFC/Mastercard to Get 10% instant discount. Now Confirm the Order & You will get the instant discount if there is any. There will be many loot deals as expected. If you want to catch all. Please Join us & we will send the deals directly to you as soon as possible. Keep Your HDFC card ready if you are looking for large home appliances.